Are you suffering from neck pain, back pain, hunchback? Are you unsatisfied with your unconscious slouching posture? If the answer is yes, you need this back posture corrector. What can you benefit from Ambcol posture corrector? How to use your corrector? It's recommended that you start with 30-40 minutes, 1 time a day. If you are comfort with the first 30-40 minutes, you can gradually extend the time by adding 5-10 minutes a time. 2 hours a day will build your muscle memory. CORRECT YOUR POSTURE - Ambcol shoulder corrector reminds you to correct your posture by giving you a minor discomfort when you slouch. The discomfort would be gone as soon as you get back to the right position. REDUCE YOUR PAIN - If you are suffering from neck or back pain, this back brace would be a perfect solution. It helps to ease the tension and reduce pain by reminding you to keep the right posture. DEVELOP A HEALTHY HABIT - The ultimate goal is not keep on using this back posture corrector. By wearing the back support brace 2 hours a day, Ambcol helps you develop your muscle memory in 3 weeks. Then you'll only need it occasionally. USER FRIENDLY - the highly adjustable design of our back brace makes it easy to put on and take off. 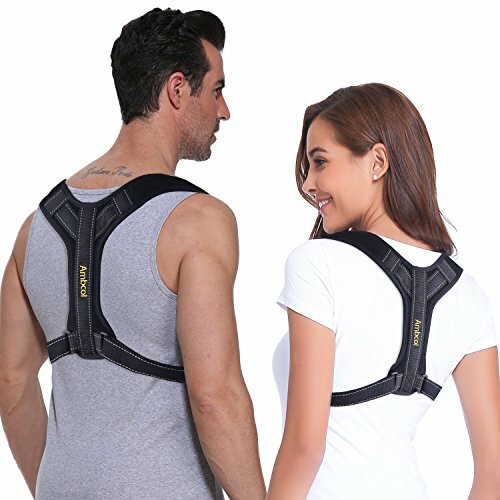 You can use the clavicle brace without asking for help. ENVIROMENT FRIENDLY - We take the environment with great importance. To avoid necessary environmental pollution, we chose recyclable and reusable packaging material. If you have any questions about this product by Ambcol, contact us by completing and submitting the form below. If you are looking for a specif part number, please include it with your message.